Moscow sees U.S. objection to a U.N. statement condemning the recent terrorist attack in Syria as a double standard. The discussion of a U.N. Security Council statement condemning the latest terrorist attack in Damascus, that killed 53, has engendered yet another upsurge in Moscow’s criticism of Washington. On Feb. 21, the United States blocked a Security Council statement drafted by Moscow to condemn the attack. Moscow subsequently accused Washington of applying a double standard. “This is disappointing because, until recently, all Security Council members — all, without exception — were always committed to resolutely condemning any terrorist attacks, no matter by whom, where, or why they were perpetrated,” Russian Foreign Minister Sergei Lavrov said at a press conference on Feb. 22. The statement drafted by Moscow reiterated that all forms and manifestations of terrorism presented a serious threat to international peace and security and could not be justified; it also reaffirmed that Security Council members intended to continue fighting terrorism in accordance with their obligations under the U.N. Charter, Interfax reported. “We view this as a manifestation of double standards and consider it to be a very dangerous trend of our American colleagues, abandoning the fundamental principles of unconditional condemnation of any terrorist attack — the principle that ensures unity of the international community in fighting terrorism,” said Lavrov. The United States U.N. mission spokesperson, Erin Peltin, stated that the U.S. did condemn the attack. “We agreed with the Russian draft of a statement from the Security Council and only sought to add similar language on the regime’s brutal attacks against the Syrian people. Unfortunately, Russia refused to engage on a credible text,” she said. On Feb. 21, a blast from a car loaded with approximately one ton of explosives on Al-Thaura Street in central Damascus damaged buildings within a radius of 437 yards, including a hotel, a school and a bus station, as well as dozens of cars. 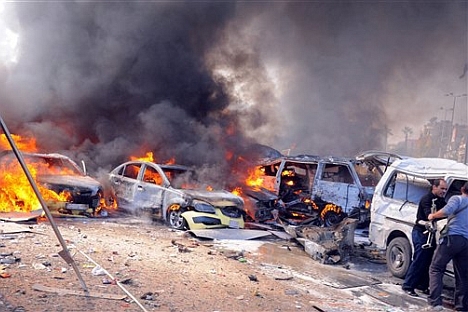 Presumably, the explosion was targeting the Central Committee of the ruling Baath Party. According to the government, a total of 53 people were killed and around 200 were injured. Syrian human rights activists reported 83 dead. The explosion affected the Russian Embassy, whose fence stands just 164 yards from the explosion’s epicenter. The blast shattered windows but inflicted no major damage. No Russian diplomats were injured. Observers believe the militants could hardly have managed a direct hit on the diplomatic mission, which now resembles a fortress. The compound is surrounded by a high wall with barbed wire, with only rooftops and antennae visible from the outside. Syrian military guard the entrances. Security measures are even stricter at the “Mercedes” — a residential building for Russian specialists working in Syria. It is circled with concrete blocks, sandbags, and barbed wire and is guarded by machine-gun-toting Republican Guardsmen. Approximately one year ago, militants attempted to shell the residential complex with grenade launchers. The Syrian government has accused a terrorist group affiliated with al-Qaeda and financed from abroad of masterminding the explosions. The National Coalition for Syrian Revolutionary and Opposition Forces has condemned the attack. Experts point out that, since the beginning of the crisis, Islamist radicals have flocked to Syria from Iraq and other countries in the region. Those people do not report to official opposition leaders and want to turn Syria into an Islamic state. They are also well versed in terror tactics. At least five large-scale terrorist attacks — all using car bombs — were committed in Damascus last year alone. The United States and Russia were both quick to condemn the terrorist attack. The conflict between the government and the armed opposition has been raging in Syria since March 2011. According to the latest U.N. data, around 70,000 people have been killed. The Syrian government claims to be facing resistance from well-armed militants supported from abroad. “We strongly condemn any indiscriminate acts of violence against civilians or against diplomatic facilities in violation of international law, and we continue to emphasize that perpetrators on all sides have to be held accountable,” U.S. State Department spokesperson Victoria Nuland said. The Syrian question will be the focus of the meeting between Russian Foreign Minister Sergei Lavrov and U.S. Secretary of State John Kerry on Feb. 26 in Berlin. The article is based on reporting by RIA Novosti, RBC Daily, Vzglyad, RT, and Interfax.